Amazon has got this Duvet Cover Set with Zipper Closure priced at $19.99 to $29.99, but enter promo code AMMFSLD4 at checkout and that price drops by 50% to $9.99 to $14.99 with free Prime shipping. Three sizes (twin, queen, and king) and six colors (white, burgundy red, grayish blue, gray, camel, and navy blue) are available. 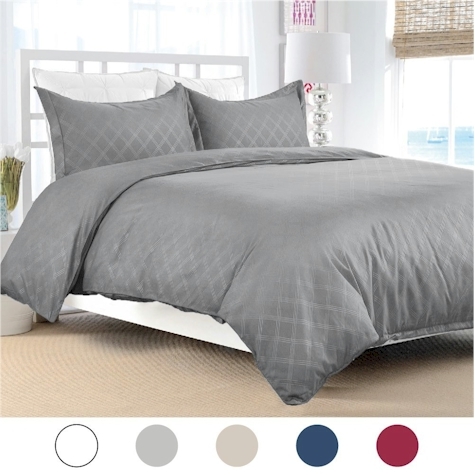 This bedding got 4.0 out of 5 stars over 512 customer reviews and is an "Amazon's Choice" item. Material: 100% Microfiber for a luxurious, soft and plush experience, yet are wrinkle and fade resistant. Hypo-allergic and durable. Finely finished hemmed edges create a lovely drape of the Duvet and pillow shams. Original Design: Simple and elegant diamond motif creates a crisp and chic designer look. Original design contains zipper for secure closure. Fabric touches silky soft. This Full/Queen size duvet cover set (86*96in, 2 pillowcase 20*26in) has a zipper closure and concealed corner ties to ensure the duvet non-slip ensuring greater comfort at night. It can also be used as quilt cover or comfort cover. Care Instructions: Machine wash cold water separately. Do not bleach. Tumble dry - Do not dry clean.